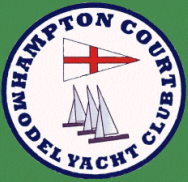 Hampton Court MYC pulled out all the stops for their annual IOM Charity Open Event on the 10th January. With an excellent entry of 30 boats there was plenty of race course action and exceptionally close racing. The prevailing south westerly wind blew as predicted at 8mph throughout the day and the rain held off despite some ominous looking clouds appearing overhead in the afternoon. The fleet was split into two for the seeding races which were won by Dave Andrews (HCMYC) and Darin Ballington (Manor Park), both sailing BritPop designs. The Race course was set virtually over the entire length of the Rick Pond and was designed to give the maximum number of overtaking opportunities available to skippers and help those who may have made a poor start. In fact the race starts were very competitive in both A and B fleets and several general recalls were needed throughout the day despite much tweaking of the start line to achieve the desired amount of port hand bias. Within the first few races it became clear that Darin Ballington was going to be a very difficult man to beat. In fact Darin went on to win every one of the five races which made up his score for the day; a result not seen at Hampton Court before. 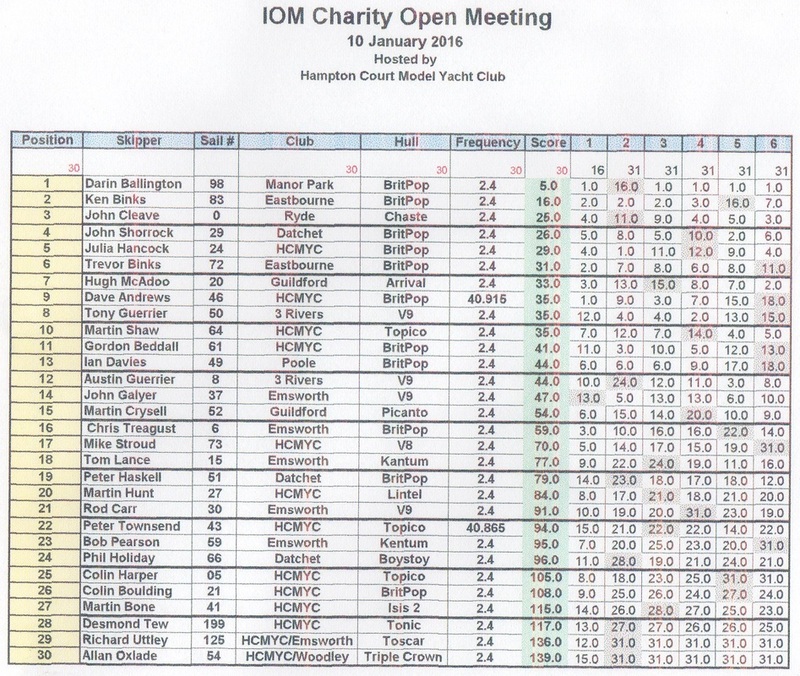 Darin won the day quite convincingly followed by Ken Binks (Eastbourne) 11 points behind. Positions 3 to 10 were only separated by 10 points which confirmed the level of competition in top third of the fleet. First Hampton Court Skipper was Julia Hancock in 5th place. A very successful days racing coupled with the fact that it was for a good cause - as a result of the day’s event we have raised £433 for our chosen charity, “Momentum”. “Momentum” is a local registered charity established in 2004 which aims to help children (up to the age of 17) undergoing treatment for cancer in Surrey and South West London. “Momentum” supports not only these children but the whole family, parents, siblings and grandparents. By establishing close links to the families they can identify ways to help that fit their specific needs. Support continues as long as the family needs it. My grateful thanks go to the race team, Laurie Bower, Peter Constable, Peter Smith and Graham Gurney.